I love living in the city. I love being close to the heart of things and where there’s a constant turnover of places to eat and drink, driven by cultural diversity and restless entrepreneurism. But then again, sometimes I crave quiet – a bit of serenity and a bit of luxury. And when I do, it’s to places such as the Fox and Hounds in Exton I go. Rutland is not short of chocolate box villages, and Exton is one of the finest. Trucked away between Oakham and Stamford on backroads that go nowhere in particular, it’s awesomely English. There’s a pretty village green, solid stone cottages with perfect thatched roofs, a big manor house with a tragic story attached and, hurrah, an impressive 18th Century pub. Last year it attracted the attention of Rochelle Bushell who along with her son David Graham had run a series of successful bars, restaurants and guest houses in South Africa. The opportunity to revive this beauty was too tempting to resist. Since taking over they have been developing some stylish bedrooms, doing out the bar and restaurant with Rochelle’s eclectic collection of furniture from around the world and developing the kitchen to offer a fine, distinctive food offering that is now ready to take its place among the best in the county. Walking into the bar area, you immediately feel the weight of the world disappear. Big old comfy sofas, huge gilt mirrors, heavy drapes and cosy fireplaces – it impresses with a slightly faded grandeur; smart enough to be seriously posh, but lived in enough to make you feel at home. On our visit there was a lovely jazz and blues soundtrack too. On reading the menu, the feel good factor raises further. The dishes have been developed by David Graham and head chef Omar Palazzolo, a young Milanese chef who has La Gavroche and Nobu on his CV. The two of them share a passion for fine British produce and for dishes that make the most of it. There is still a village pub role for the Fox and Hounds, and there is a classics menu of fish and chips, shepherds pie and erm, pheasant and chanterelle terrine with whisky and lemon spiced marmalade – all around a tenner or so. However the à la carte has compelling dishes that scream out to be tried, so that’s were we were headed. First off though, some of the very best nibbles I’ve encountered (left). Sumptuous olives and little cornichons in a citrus dressing with carefully pared orange zest, flatbreads, a brilliant purée of Mediterranean vegetables, a little pool of pesto and a smear of nduja, a spicy, spreadable salami from Calabria. There was even a super-seasonal little flower-bud of wild garlic. 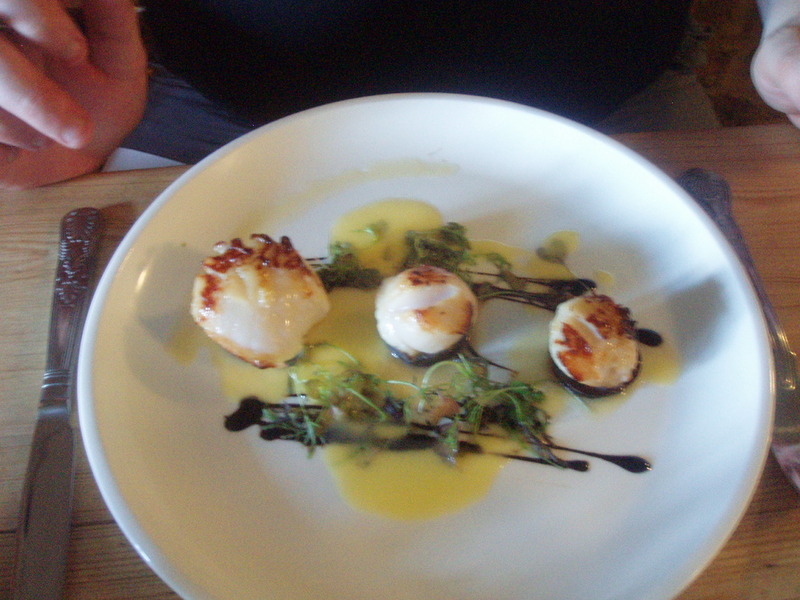 That set me up for some excellent scallops, with an intense velouté of Jerusalem artichokes with truffle oil, poured at table to give a real aromatic boost. 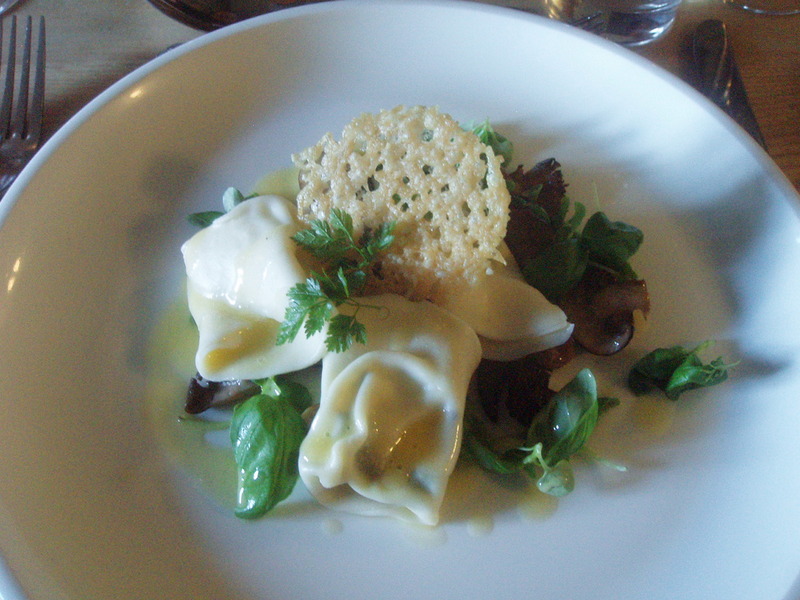 There were also great fresh winter greens and pretty little artichoke crisps. Clearly this is a kitchen that works hard to get the most of its ingredients. The same virtue was present in another starter of lightly battered balls of duckmeat with seasme-spiced noodles and well judged sauces of hoi sin and plum wine jam. A main of pan-roasted Norwegian cod was a highly successful blend of technique and flavour. The fish given a nice crust and coming in a foaming sauce of apple and pernod with madras spices. Filled out with braised leeks and a cassoulet of cannelini beans, it was a treat to all the senses. Most dining pubs offer a pork dish but the repetoire is fairly narrow. I’ve had enough belly of pork for the foreseeable future, but here was something much more interesting. A tender, oven roasted free-range loin that was, heaven be praised, still a little pink, and which had been given a yoghurt, rosemary and maple marinade. With some fat woodland mushrooms, little pillows of crisp “pork air”, and a sweetish cider and mustard jus, this was no run of the mill dish but a bit of a joy-ride. Some may not enjoy the range of flavours but I was delighted to find chefs wanting to take a few risks when developing a new dish. Deserts were a light, refreshing and technically spot-on lemon posset with pistachio crumb and raspberries, and a marvellous bunet(left), a traditional Piedmontese dairy desert with chocolate and amaretti, here served with with salted caramel ice-cream and a crème anglaise with a few sprigs of chervil. Poached blueberries appeared to have been replaced with blackberries which was a shame, but this was a light desert that punched well above its weight. There’s a serious wine list, although only a limited number available by glass. That said, our Vouvray was superb. And what a treat to have young staff who are friendly, focused, attentive and fully on top of the menu. 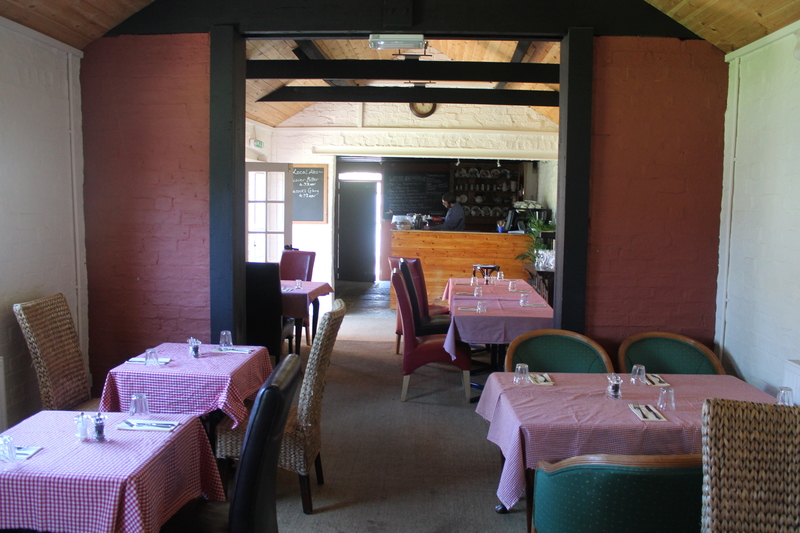 The Fox and Hounds obviously has an old time charm about it, but the food is adventurous, high quality and definitely brings something worthwhile to a fairly crowded market. If I had a job, Friday probably would have been payday. Seemed like a good excuse, then, to go somewhere nice for lunch. Leicester’s leading criminologist was also looking for a trip out somewhere nice and so the two of us drove out to Rutland to take advantage of Lunch for Even Less, the annual post-Christmas promotion from a group of top-end places. We’d settled on The Olive Branch, Clipsham, a long-term favourite but somewhere neither of us had been for a couple of years. It’s such a lovely building and the pub inside is run perfectly. It hums with contented diners, a log fire crackles and staff move around efficiently, constantly checking all is well. There are nice little touches – your name is on a little chalkboard when you arrive at your table, which is then hung behind the bar and becomes your tab. And when a dish was served while one of us was having a comfort break, they immediately offered to return it to the kitchen to keep warm. The kind of service that brings you back. And the food? Well we sent back six of the cleanest plates you’re ever likely to see. The Olive Branch may recently have lost it’s long-held Michelin star but I don’t think diners could care less. The menu remains inviting, unpretentious British food cooked with finesse and with concern for flavour. 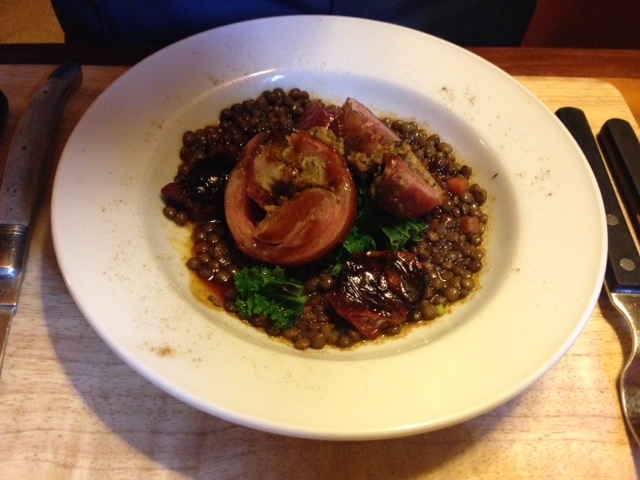 I started with a cracking little dish of lamb breast with a pine nut stuffing and a lentil stew with sundried tomatoes. The lamb was a classic case of a humble cut delivering big hits of flavour – a real feel-good starter. 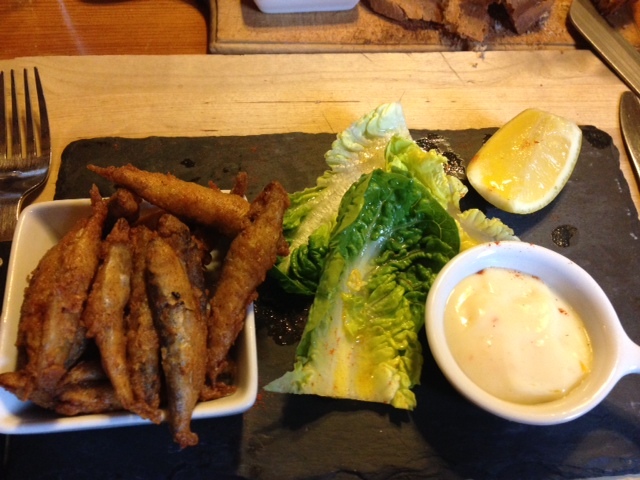 Neil’s devilled whitebait were perfect – fresh, crunchy, fishy with mayonnaise and braised baby gem. Mains were classics. I had a coq au vin of such intensity it was all I could do not to pick up the dish and slurp the remaining sauce. Tarragon mash and roast carrots were perfectly done too. Neil stuck with fish and a beautiful fillet of gilthead bream that shimmered on the plate as it sat on a mountain of fregola with a few tempura whitebait. For desert we both picked trifle and simply sighed with pleasure as we tucked in. 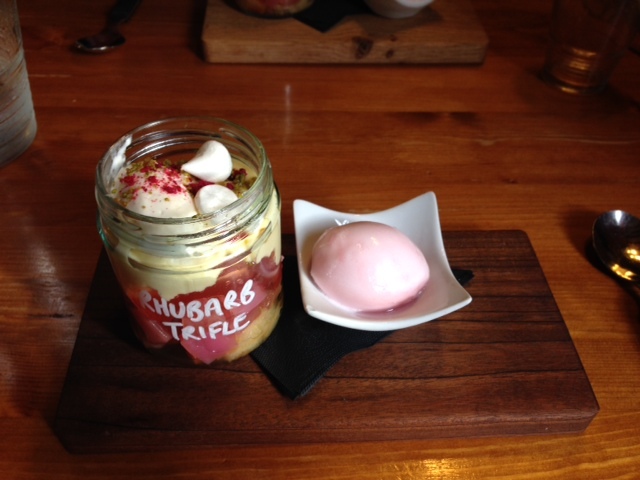 Poached Yorkshire rhubarb – still retaining a bit of bite – sat at the bottom and a hefty jamjar with sponge cake soaked in a sherry of real quality (Pedro Ximinez), with jelly and sensibly-judged layers of custard and cream, accompanied a by wonderfully light and fluffy rhubarb sorbet. Blissful. Three courses of food this enjoyable for £19.50 counts as a good deal. There were plenty of countryset types in green gilets so, yes, it’s a little posh (as we left we saw a young barman come out and jump in a sports car – never seen that happen at the Ale Wagon), but it’s not stuffy – it’s friendly and welcoming. And as you leave, you start planning when you can go again. News reaches me at last of Dameon Clarke. It was a great shame when he had to close his Stamford restaurant Assiette late last year, so it’s good to see that he’s pitched up again in the region, this time at The Wicked Witch in Ryhall, a few miles north of Stamford. 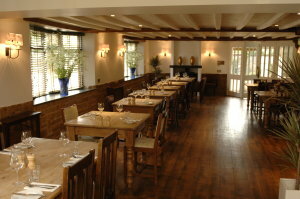 The restaurant is a glammed-up village pub that reopened earlier this year when a Peterborough-based team including Darren Ferguson, son of Sir Alex and manager of Peterborough United, decided that there was scope for another venue for people who regularly pack out places such as the Olive Branch in Clipsham and the George in Stamford. Judging from the website it looks smart, aspirational and a teeny bit sterile. The food should be great whatever – the menu looks a lightly reined-in version of Clarke’s trademark technical exuberance. 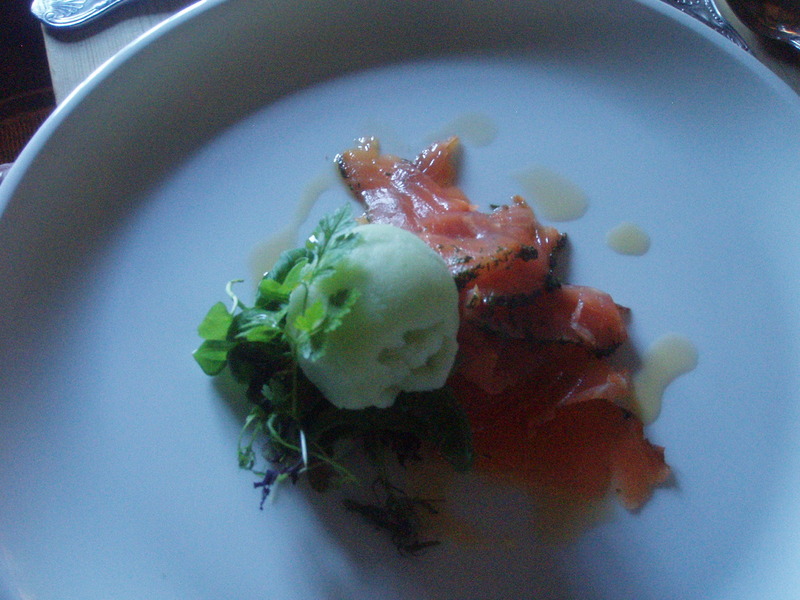 My first order would be hot ham hock, quail egg and pea puree, followed by pan friend fillet of sea bass with cauliflower textures, lobster caviar and ginger bhaji, ending up with choclate tonka bean mousse, pistachio marshmallow and orange jelly. Good luck Dameon – hope this works out for you. I spent an interesting hour last week talking with Sallie Hooper. She’s spent the last few years co-ordinating Leicestershire Foodlinks, the body that helps promote and develop local food producers across the county. She’s now sort of gone over to the other side and started her own business in the form of the restaurant Les Rosbifs. 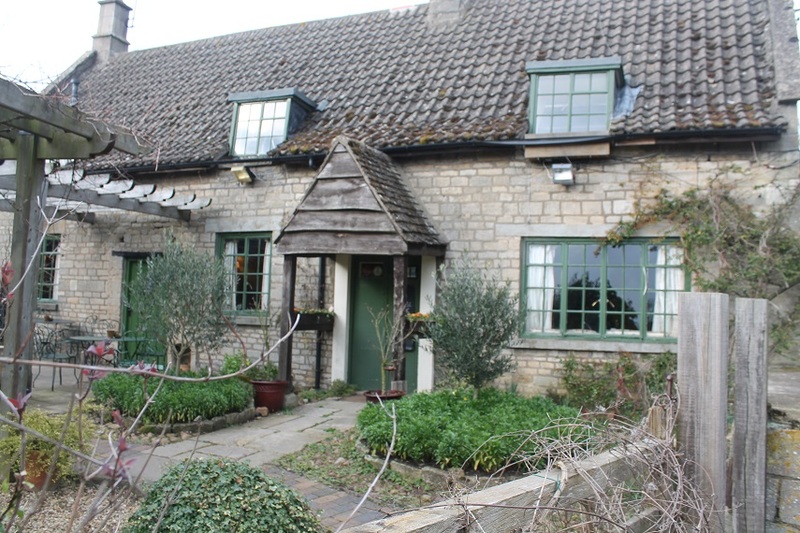 The restaurant is located within Northfield Farm in Cold Overton, a few miles north of Oakham. It’s well-known for its fantastic rare breed beef and pork and high standards of animal welfare. 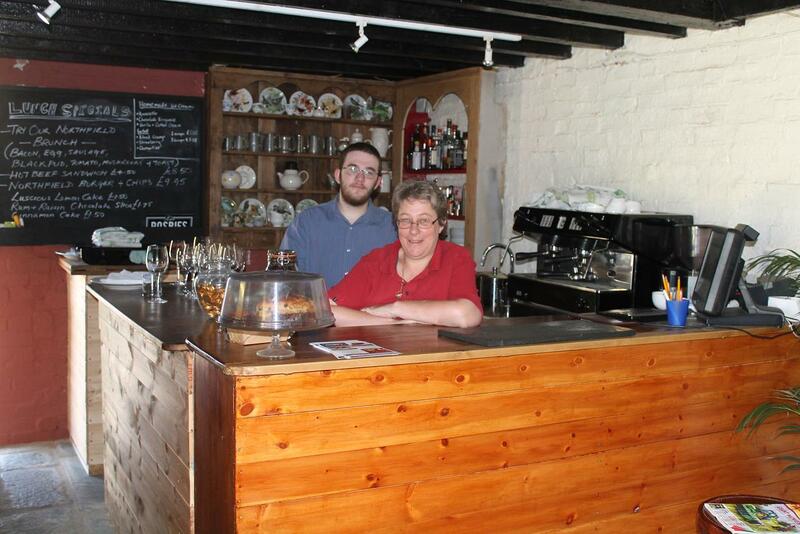 Owner Jan McCourt has developed a popular farmshop and tearoom and then restaurant. For various reasons, including his own health problems, he had to shut the restauarnt but Hooper has seized the opportunity and relaunched it as a family buisness with sons Duncan in the kitchen and Gorge and Ollie front of house. Duncan was previously cooking at the Queen’s Head, Nassington, a rather smart inn on the Nene near Peterborough. The name is a nod of course to both the fine beef produced at Northfield and to the model of Ferme Auberge, the informal farm restaurants serving up quality home -produced food that Francophiles dream of finding as they drive through the Dordogne. The style is rural – all check tableclothes and riding tack on the wall. I’ve not eaten there yet but all the signs are promising. Obviously Northfield Farm meats feature, but the deal is that the Hooper’s can source their produce from where they wish. Given Sallie’s experience she’s got a very good handle on where to get the good stuff locally. The food is pitched mainly at solid British classics with strong focus on seasonality – a blowout Sunday lunch might start with cauliflower and Colston Bassett Stilton soup with truffle oil and toasted almonds, followed by roasted Nothfield beef, yorkshire pud and goose fat roasties and ending up up with sticky toffee puddding with salted caramel sauce. Evening menu offers steaks and crowd-pleasers such as corn-fed chicken breast with spring onon and cheddar risotto or Belvoir-ale battered fish and chips. Bread is all baked on site and the whole place gives off a nice unpretentious food-focussed air. I look forward to going at some point – do give us your views here if you get there first. I was working in Rutland this morning (of which more soon), which meant I had time to quickly checkout the Lord Nelson in Oakham. It’s run by the people who opened the hugely successful Tobie Norris pub in Stamford, and is very much in the same mould – picturesque ancient building just off the main drag of a propserous market town, unpretentious but self-confident marketing, nice selection of real ales, simple but appealing food menu featuring the likes of stone-baked pizzas. I settled for a big of cheese and pickle and the delightful Nottingham beer Harvest Pale. 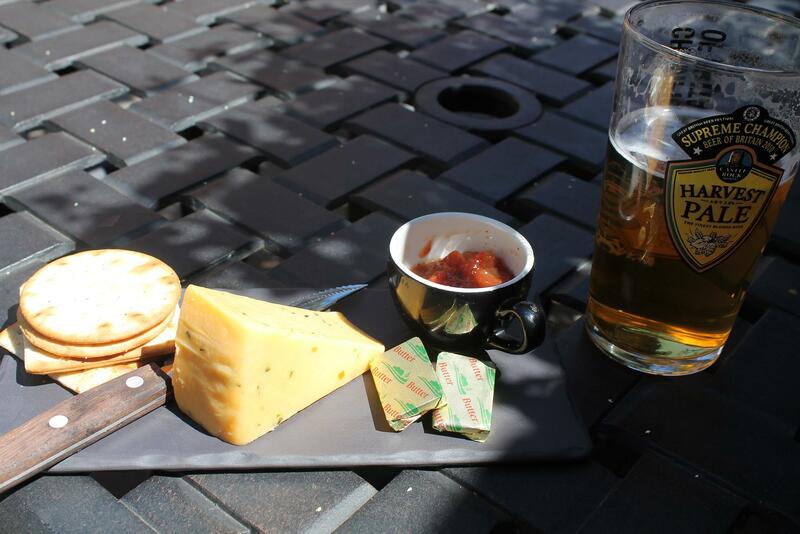 The weather had finally decided to show us what we’ve been missing all this time, so sitting out in their sun-trap yard with this for lunch sent my welllbeingometer soaring. It’s in the building in the corner of the market place that used to house Nick’s restaurant, where Dameon Clarke among others used to ply his trade. Good to see the building put to good use and definitely worth a visit if in Oakham. Some weekends really make you feel that, despite everything, it really is worth perservering through this vale of tears. This has been one such. It started on Friday evening with a cold drink with former colleagues in Manahttan 34, a welcome addition to the bar scene in in Leicester’s Cultural Quarter. Then I helped win 2nd prize in a pub quiz at Leicestershire Tennis Club. An auspicious start I’m sure you’ll agree. Saturday, with the temperature rising to extraordinary highs for the end of September, I took a lovely drive through the Leicestershire countryside to the East Midlands Food Festival in Melton – an annual highlight that gives an opportunity to renew acquaintances and check out new businesses. 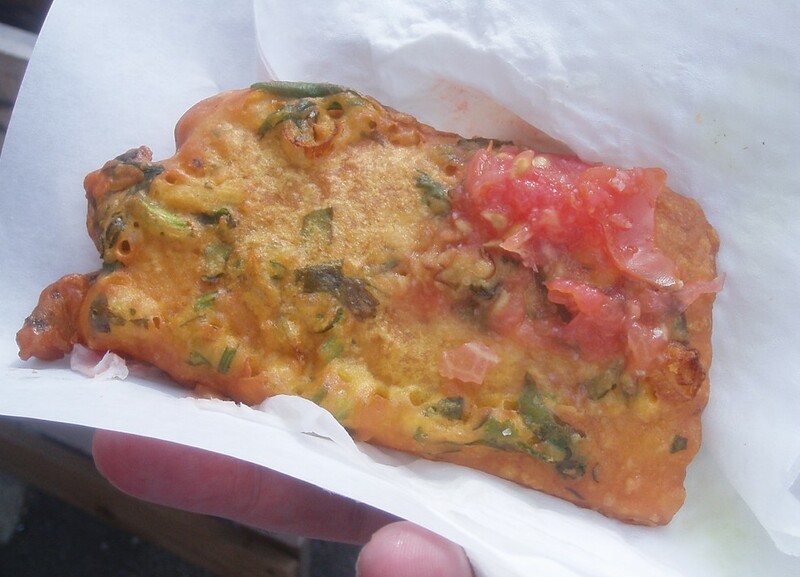 My peronal highlights included refreshing blush-pink apple juice from Discovery appples, a big slab of wild boar belly, some nose-blasting horseradish and habanero relish, a plum and gooseberry pastry from a little business called the pantry in Kettleby, and Du Pain Frier (right), a delicious piece of Mauritian streetfood – deep fried chickpea bread with green herbs and spices and a tomato salsa. Then it was back to Leicester and a sun-drenched, glorious 4-0 defeat of Derby County, celebrated duly with a fine pint of Landlord. And then on to Sunday, with the weather still being more like July, and a four mile hike around classic English countryside in Rutland complete with a 12th century church. We finished up fortuitously at a stylish dining pub in the shape of Braunston’s Blue Ball – the oldest pub in the county and a nice mix of cosy nooks and crannies without the clutter and tutt. The food was really rather good too. It’s a serious restaurant and we found the starters all showed deft touches in cooking and presentation and qaulity ingredients. Home cured juniper and citrus salmon ( left top) came with a delicious, refreshing cucumber sorbet, while fat seared scallops (left middle) perched on Grasmere farm black pudding withe a lemon beurre blanc dressing and my spinach and ricotta tortellini (left below) sat on a fricasee of wild mushrooms and a fantastic parmesan crisp. High quality posh pub grub this. Mains didn’t really come out in the picures but imagine big satisfying plates of roasted loin of venison with a lentil and herb cassoulet, honey glazed duck, topside of beef and roasted leg of lamb from nearby Launde. My lamb had a marvellous flaovur though it was slathered in a fairly undistinguished gravy, but few pubs – even ones this good – seem to get that right in my experience. Our deserts included a very good sticky toffee pudding, a selection of superior ice-creams which were restrained in flavour (honeycombe, ammaretto and coffee) but beautifully creamy. Sadly a creme brulee disappointed with it grainy texture – a big cross against that but it didn’t spoil our sense of well-being. Service had been helpful and the atmosphere was jollied along by sounds of a great hotjazz duo drifting in from the bar to our little alcove. The Blue Ball has long been a destination pub but has had it ups and downs over the years. On this showing I wouldn’t mind going again. And then it was home to contemplate the rain, wind and darkness that will settle on us for the next six months. A memorable weekend to help carry me through, though. 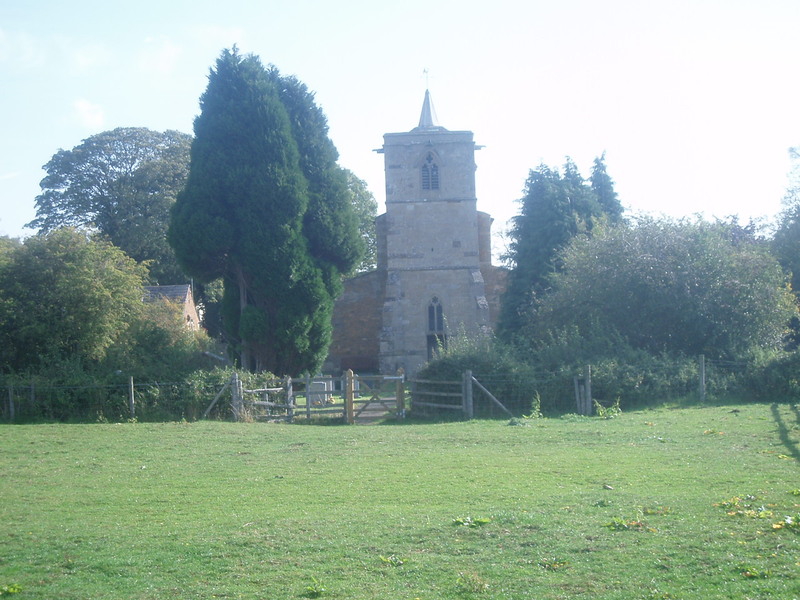 I’ve enthused here before about The Marquess of Exeter in Lyddington, near Rutland. Yesterday afternoon I had the pleasure of a long chat with chef patron Brian Baker. He’s had a fascinating career, a whiststlestop tour of which might start with being butcher’s delivery boy and go on to being the youngest ever chef to receive a Michelin star and several years spent buzzing around the world on private jets and 200ft yachts cooking for plutocrats and their A list guests. A later move involved running parties for 12,000 Vodafone staff with a budget of £6 million. Running a gorgeous old inn in a smart but out of the way Rutland village might seem an odd move, but it’s fortunate for the region. Baker does straightforward classics here that bear the imprint of all that he has learned – incredibly smooth parfait, perfect steak frites, and top notch creme brulee, with good service in a lovely enviornment. What more do you want? If you want to read more, check out the forthcoming July issue of Great Food Leicestershire and Rutland.